This mission is my new favourite. Not only is it challenging but it has also a well-designed map with more than one way to achieve the final goal. And most importantly there is a really great movie by director John Woo (aptly named “Red Cliff”) which you should watch if you can. Be careful: you need the 2 part version (run time approximately 5 hours), not the crippled 1 DVD version. After watching it I even came to terms with the Zhuge Liang cut scenes because the guy in Atlantica Online is obviously a cartoon version of the “original” Zhuge Liang in the movie. Also great in this mission are the drops. Every monster can drop phoenix boxes, bosses can drop dragon god boxes. That they do quite rarely, I have to admit, but the drops more than outweigh the costs for upgrades, scrolls and potions. By the way: The trebuchet is quite useless, it won’t add anything relevant in terms of fire power. Only if you feel that you may be wiped out you should acquire one as fail-safe. Run up the left lane. Meet two Warlords Of The Blade at 1. Kill first mini boss (Ma Yen) at 2. Take out the middle summon portal in C10 (3). Go down and right via D/E9 to the right summon portal and take that out (4). Beware the net trap right before the portal. And be careful not to aggro the troups in the boss area – there are multitudes of cannonneers right behind the entrance at the left of E10. Then move forward to Zhang Yi (5). He has a freezing aoe, so take care. You don’t need to destroy the left summon portal. It is sufficient to defeat the mini boss and the troups which spawn directly after it. Go back via row 11 (that is: top edge of boss area) to the right and kill the cannons and the other minions. Try to kill Cao Cao only after you have positioned yourself in the top right corner (6) and after healing up a bit. Then snipe the Emperor Of Destruction to death. There are 6 mini-bosses loitering around in the boss area (that is north of the middle summon portal). Two are behind the middle summon portal and four roughly at the corners of the grey square in the map – the “boss plateau”. We don’t go after them but kill them as they come. If you go aggressively in their direction they have the tendency to group together. And I do not want to know if we can stand 3 or more of these minis – I am satisfied with the knowledge that we can overwhelm 2 of them at the same time. Better win cowardly than lose bravely. The advantage of this strategy (made known to me by Godrayn) is that you have time to heal up after taking down the middle summon portal and then again after destroying the right summon portal and defeating the monsters on the right side of the boss area. And afterwards, when you have to fight the final boss, you won’t suffer from the pressure of the right summon portal because – you may guess it already but I like to point out the obvious very much, so I will continue and you can’t do a thing against it – the right summon portal is already destroyed. Hint: You can avoid the fight at “1” with the 2 warlords. In B5 turn left instead of right. 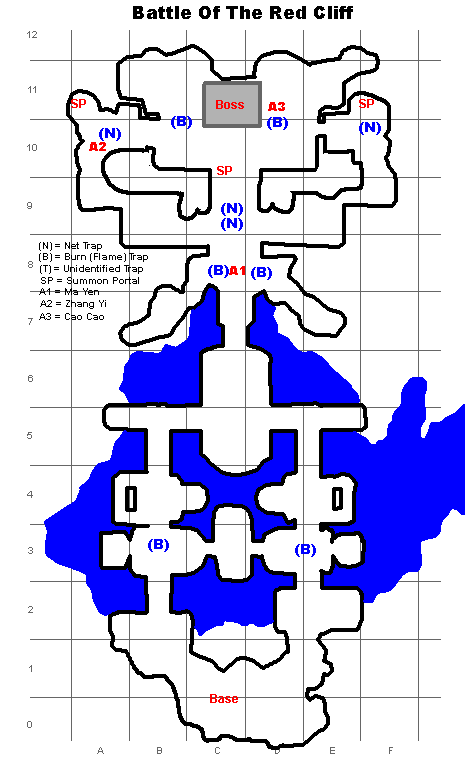 There is a “secret” passage between A5 and A7 without any monsters. If you want to see that, watch one of my videos. Nice idea to avoid monsters. hopefully you do not get the spawn bug where the SGs put out mobs every 2 turns. Hm, we will try that next week. By the way: you can avoid the two Warlord Of The Blades. Instead of turning to 1 in the strategy map turn left, go to A5. Then walk to A7/B7. While the map in AO (and the trap map which is nothing else than a schematic picture of that) looks like there is no connection, in fact there is one between A5 and A7. You are basically sneaking on Ma Yen from the left. The disadvantage is that you skip a lot of looting possibilities. I will update this article soon (after the next patch). I can only say that I can’t – yet. I fail because of the time limit. It is possible to solo red cliff. I did it with feast + title. My armor and stuff (those worth mentioning) is pretty much 2 +10 dragon god’s light armor, 1 +10 dragon god’s robe and 1 dragon god’s gun +10, 1 dragon god’s cannon +10 and 1 dragon god’s staff +10. The rest are pretty much +0 – +1 evil gear. You will surely need +10 gear for oracle to solo red cliff successfully. Always finish it with 5 – 15 minutes left. what weapon you used in here… ?? and how many freezing scroll you have used in here..
sorry to ask a simple question, what item is you put at 5th quick slot? and also you have good gear (high +) but why ear and bracelet +0? My earrings and bracelets are +0 because I am very poor. What rings do u suggest for cannon main? Is there a good reason why u use +10 spearmaster rings over good pangus? Yeah, money issues… Upgrading from Spearmaster to Pangu is not as urgent as – say – upgrade to +10 pega armor. Is it me or has Red Cliff become more difficult to solo? I took a break from TBS (and Atlantica) for about 2 months to finish school. Before leaving I could solo Red Cliff fairly easily. Since coming back and post patch, I’ve failed 5 attempts. Maybe I just forgot what I’m doing or does the nerfing of range health make that much of a difference? Has someone tried the solo mode ? If you think you don’t damage the monsters as well as earlier: that is you. If you think you die/hurt more than earlier: that is the new patch. But 15% less hp may be inconvenient but should not be that decisive. How to pass this mission a magician? if what that advices? And why not to do more videos of variants with the different classes of main? I just finished squad solo as staffM. I went with ody + jani (+ catapult for SPs). Tried to solo it with druid + jani, but I was a few turns short (the enemy turns take forever!). Biggest hurdle was having to deal with all the minibosses scattered around the map. By substituting ody for druid I was able to finish with ~15 mins remaining (Makes short work of the minibosses). My staffM is built around BW and BoL…so this may not work if you went with FB. My only “good” equip is a +10 evil gun. Armors are avg at +2-3 pega/evil. I followed the route laid out by this guide. Please understand that I am a normal guy with family and a job. In my spare time I like to PLAY Atlantica. And when there is still some time left, I do a video. So if you expect me to make videos of all mains there are in AO, you have to pay me – quite handsomely, I might add. That said I will make a video of Fritz when he has a sufficient level (musician main). My staff main alt Claudiana won’t reach that level anytime soon. I recommend to look for staff main videos on youtube. I think John Farson has made some (look for videos by jfarson). tips.. great buff.. kill bos fast.. some trap III, a few resur and blessing, freez to diable trap. OMG how can u got +10 evil and +7 pega?? lucky enhance at vulkanus or use atlas? ?